Whether you're into sightseeing, hunting, fishing, or just want to enjoy some quiet time in a beautiful and peaceful campground, this is the place for you. Year-round recreational areas make this a great choice for your vacation. Located just 95 miles north of Spokane, or 15 miles south of Canada on Highway 31. Located at the base of Mt. 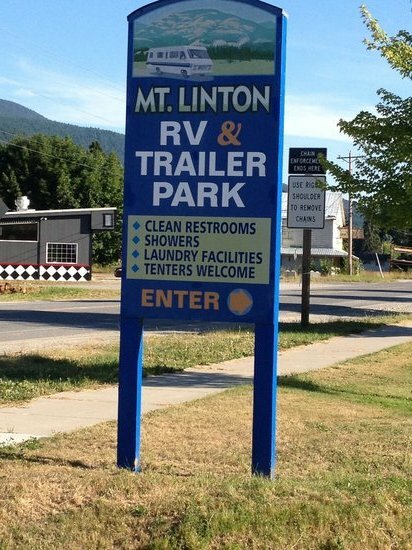 Linton, this campground is the perfect spot for you or your group of RV'ers to enjoy some rest and relaxation. Enjoy spacious sites on a beautiful treed site at the base of the mountains, complete with 50-30-20 amp electrical service, sewer and water. Some of our sites have pull-through access. The beautiful Pend Oreille River, City Park with boat ramp, restaurants, and convenience store with gas station, are all within walking distance of our RV park. We offer extended stay, weekly, and daily rates. Group rates are available for groups with 10 or more RV's.